Ololo Lodge, owned by an Australian farming family, offers the warmth and comfort of a home with effortless style and personalised service. The lodge is situated right on the edge of the African wilderness, overlooking Nairobi National Park. Ololo is only a 45 minute drive from Nairobi’s international and domestic airports. We are able to transport guests from the noise and traffic of the city, through the national park, to our quiet, leafy setting. Our staff will greet you at the swing bridge spanning the Mbagathi River, and guide you up the path to the lodge. At night our askaris (watchmen), dressed in their traditional shukas will light your way with lanterns. Our warm welcome, relaxed style, delicious home cooking prepared from our own vegetable gardens and unique location are the hallmarks of the Ololo experience. The heart of Ololo is a traditional colonial farmhouse which has been carefully restored and extended by its owners. Its rooms feature a blend of the style of ‘Out of Africa’ with a modern, eclectic accent. Guests can relax in Ololo’s large open living room, in front of the open fireplace, with wine selected from our stone cellar, or sit in the quiet of the adjoining library. All our rooms in the original building have views over the national park. There is free Wi-Fi access throughout the lodge. Our restaurant, ‘The Kitchen at Ololo’, is open to the garden and the park, and we often set up tables for lunch and dinner on our vine-covered terrace or under the old acacia trees in the garden. Evening drinks can be enjoyed on our garden terrace directly overlooking the park, with a brazier to ward off the cooler night air. This spacious suite has a traditional living area with armchairs and an open fireplace, colonial furnishings, artworks, flowers from our garden and a marble bathroom with a classic roll-top bath. The suite’s private terrace is a cool and tranquil space to relax, or a setting for a romantic private dinner. Located in the stone-clad tower with a balcony and a private terrace accessed by a spiral staircase, this room has extensive views across the park and towards the famed Ngong Hills. This contemporary suite is light and airy and is furnished with pieces of hand-crafted furniture made by our staff in the Ololo workshop. Our three tented cottages provide guests a bush experience, sleeping under a traditional makuti thatch roof and behind canvas and stone walls. These safari-style king-sized rooms are surrounded by our gardens which are planted with East African plants and are self-contained, with large beds, comfortable armchairs, modern bathrooms and private terraces overlooking the National Park. Drift off to sleep to the sounds of Africa – the cough of lion, the calls of monkeys and baboons, and the rustle of hundreds of species of birds common to the area. The original stone-walled stables of the property once housed the horses of Ololo Farm. They have now been transformed into seven rooms, each with an individual design and furnishings. The Stable Rooms have ensuite bathrooms and the terraces at the front of the building overlook our colorful gardens which attract abundant birdlife and butterflies. These charming rooms are popular with guests traveling as a group who wish to be accommodated close to each other. This delightful three-bedroom cottage is located at the end of the Stable Rooms and was once the hay shed. Now featuring modern, light-filled interiors the Stable Cottage sleeps a maximum of six guests, and has two bathrooms, kitchen, and large outdoor terrace, making it perfect for families, groups, or extended stays. We can also provide a travel cot for babies. ‘The Kitchen at Ololo’ our restaurant, overlooking the park, which offers delicious daily breakfasts, lunches and dinners. Lunch is available for day and park visitors. (Bookings are required). We create a set menu each day, which reflects our philosophy of simple food, using the freshest, seasonal ingredients cooked by the chefs in our kitchen. We source many of the vegetables from our own ‘shamba’ (vegetable garden) and our eggs come from Ololo Farm. All our bread, cakes and pastries are baked in-house. The home-style, hearty flavours of our meals are popular with our guests. Our bar is stocked with a wide range of beers, spirits and wines from South Africa, Australia and France. 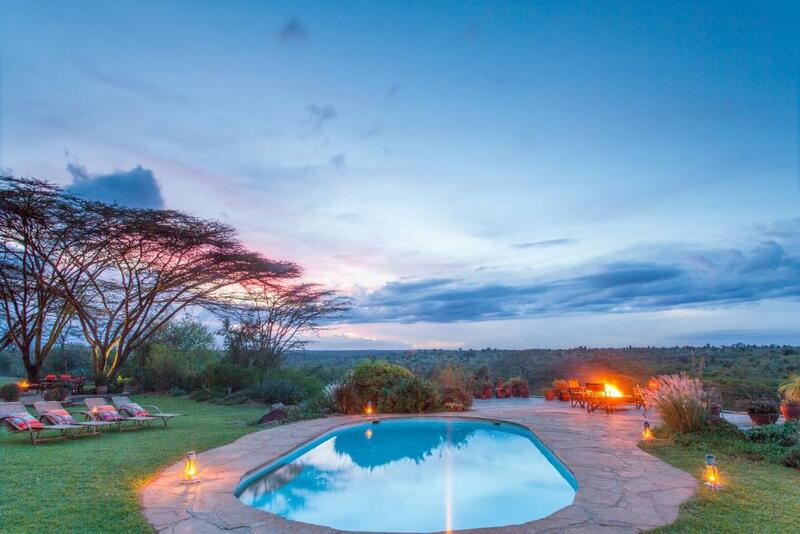 Guests can enjoy a pre-dinner drink around the pool or on the terrace as the sun goes down over the Ngong Hills. Ololo offers guests personalized or group game drives into the only national park in the world on the edge of a capital city. 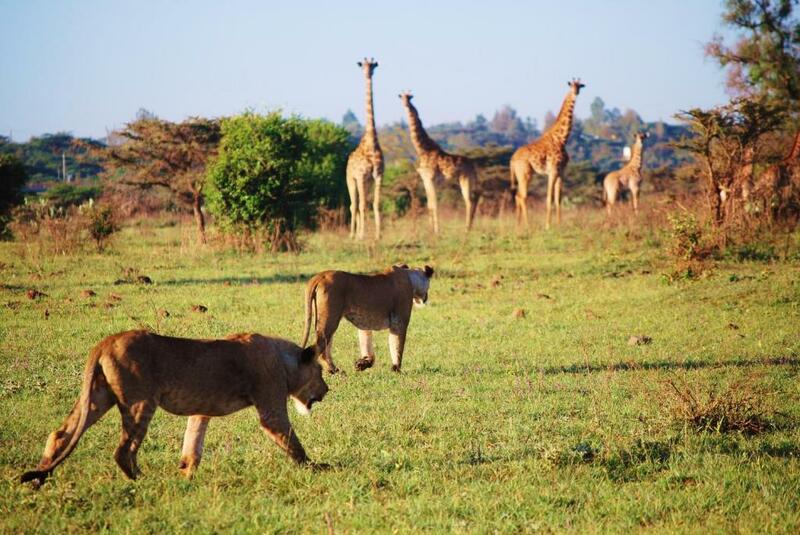 Nairobi National Park is a surprise package: 117 square kilometers in size with a diverse wildlife population which includes lion, giraffe, leopard, rhino, hippo, zebra, buffalo, gazelle, antelope and over 400 recorded bird species. Many of these birds and animals are visible from our terrace and restaurant as they move around the bush. We can arrange for guests to take cultural excursions to Karen to visit the Karen Blixen Museum set in the Danish author’s Kenyan home, the Giraffe Centre, and Daphne Sheldrick’s Elephant Orphanage where visitors can adopt a baby elephant. Anselm Kitengela Hot Glass, where craftsmen blow glass in the dome-shaped foundry building, is a short drive from Ololo. Shopping at local markets and expeditions into Nairobi to visit cultural institutions can also be arranged.